Step 1 – Install EWP Reader onto a computer that does NOT have any version of TeamMate on it. Note: if you already have EWP Reader installed, you can skip this step. Step 2 – Follow the instruction in the TeamMate EWP Reader Reference, labeled “To Install an EWP Project in the Reader” to bring the audit project file(s) into the software. Repeat for each file/project you need to review. You will then get an error that says “windows account not authorized….” Hit OK and then follow the login prompt. Step 3 – Follow the instructions in the TeamMateEWP Reader Reference to open the project file(s) and use the viewers to review the audit documentation. Another option for reviewing audit documentation is to use the Browser file system in EWP Reader. All of AOS programs are under the folder called PG (Program Group). 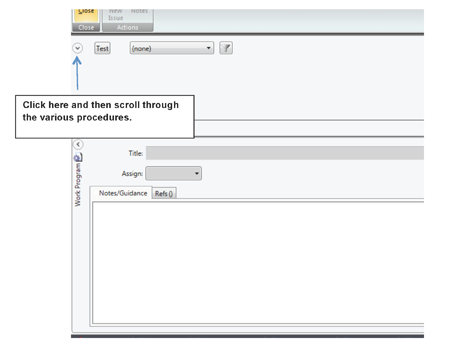 You can then click through the file folders and open the .PRG files to see the program information. Under each .PRG is a set of procedures where our testing is documented and hyperlinked to workpapers. If you see the following screen when navigating through the project click on the down arrow next to “test”.